Not all resorts and villas are the same - one major factor is their location. 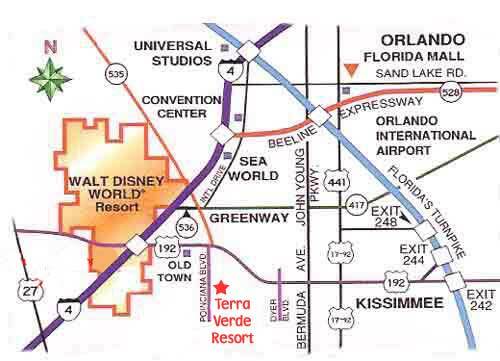 Terra Verde is a rare new resort close to Disney and all the other Orlando area attractions. It is situated on Poinciana Boulevard leading right to The Osceola Parkway that zips you straight into Walt Disney World. Seaworld and Universal amongst others are also just a short drive away. Convenient too for shopping including the factory outlets and superb Florida and Millennia Malls it is going to be difficult to fit everything into a single vacation! Within a minute or twos drive are all your favorite restaurants including The Olive Garden, Macaroni Grill, Chillis, The Outback Steakhouse, Uno's, and not forgetting Denney's and IHOP for breakfast or your good old diner fare. Our personal favorite is the Cheesecake Factory at Millennia Mall which is only about 15-20 minutes away - you have to remember to leave room for the Lemon Raspberry though! Nearby is Krispy Kreme, one of the worlds fastest growing chains - you have to watch how they make the donuts even if you can resist the temptation. For added convenience we are only a mile or so from 'Super Wal-Mart' for groceries and about everything else you could want. See the links page for a link to the Hwy 192 guide to restaurants, shops and attractions. The coast is within easy reach and only about an hour away. On the Gulf side are the fantastic beaches and attractions like Busch Gardens, on the Atlantic coast is the famous Cocoa Beach and the Kennedy Space Center at Cape Canaveral. Although the Shuttle program is sadly currently suspended, the Air Force still has an active launch program of Atlas rockets - a night launch is particularly spectacular. See our links page for details of the Nasa/JPL website. Port Canaveral is also home to Caribbean cruises if you are planning a two center vacation. A little further up the coast is Daytona home of the famous race track. Golf is a very popular past-time in Florida and there are numerous golf courses to suit all abilities and budgets within easy reach of Terra Verde. Champions Gate at Davenport, Disney Golf off the I4 and Falcon's Fire courses are just a few.